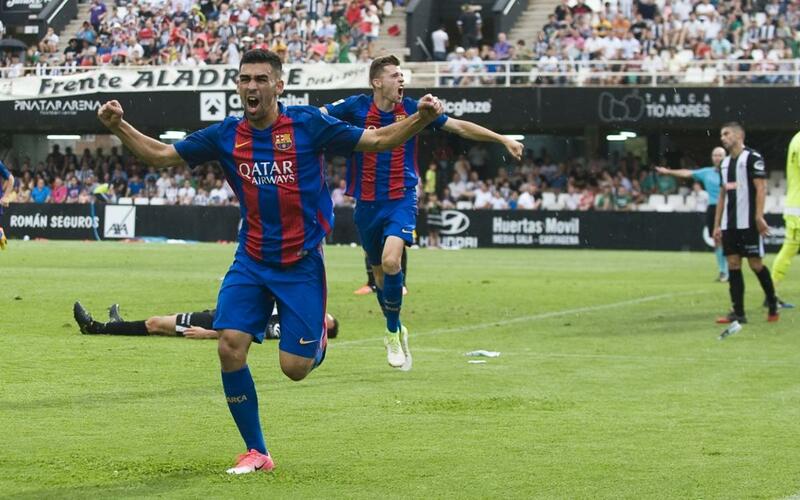 Barça B won the first leg of the Division 2A promotion play-off against Cartagena (2-1). Romera and Gumbau were the goal scorers in a tough match which the blaugranas won thanks to their intelligence and experience. Barça B went to Cartagena looking for a positive result away from home. Gerard López’s players went into the game with optimism. President Bartomeu travelled with the squad to show his support and the team played with real intensity from the off. There were few clear-cut chances while Barça tried to control the game and keep possession. Cartagena were defending resolutely and looking to catch Barça B on the counter. Barça weren’t caught out and when Cartagena did have a chance Palencia produced an impressive double save. The Catalans managed to take the lead when Dani Romera made the most of an Aleñá assist and calmly beat Limones from inside the box. Fali had a chance to double Barça’s advantage a minute later but was unable to make his chance count just before Cartagena responded with a goal of their own through Germán. The scores were level and both teams became a little bit more cautious as they looked to protect what they had with a draw being a good result for both sides. Varo had to intervene as Cartagena’s Sergio García went close to giving his side the lead. However, with nine minutes to go Gumbau broke the deadlock with a fabulous long-range strike to give his side a fantastic result ahead of the return leg in Barcelona. Cardona almost scored a third but in the end they secured a crucial 2-1 win that will give them a good chance to progress into the final play-off round at the Miniestadi on Saturday.